On 20 September, Antonio Colombo kicks of the new season with a solo show by the famous artist Tim Biskup, at his first exhibition in Italy. “This exhibition may appear to focus on themes of life, death and spirituality, but that is not what it’s really about. These are works of meditative practice. Finding the balance between my conscious aesthetic choices and the unpredictable nature of improvisational gestures requires a level of attention and presence that I have, until this series of work, never approached. I had a sort of revelation when I stood in front of the work of William De Kooning at NYC MOMA in November of 2011. There is a sense of pure translation of his humanity onto canvas in his lines. I could feel his pain, his joy and his longing for the image that fluttered through his head. It was a reminder of who I am, what I love about art and how the constant pressure of creative impulse must be respected and obeyed. It was in the spirit of his practice that I set out to make work for this show. Accordingly, the title of this exhibition comes, with all due respect, from his work of the same name. My natural starting point for this was in abstraction. It is where my purest lines are. My style and personality are free and intense when I throw everything else away. Abstract drawing and painting reminds me of my identity and prepares me to approach figurative imagery. The first image that emerged was, of course, a human skull. For as long as I can remember, I have been obsessed with the image of the human skull. Clearly, I am not the only one who feels this way. Perhaps it is the complex and elegant geometry and pure aesthetic balance of the object. More likely our attraction comes from our guts and not our eyes. The skull is ourselves stripped of life. It is a clear reminder of our mortality. It can be a brutal and unnerving signpost that stares us down and fills us with dread, but at best it brings us into the present and reminds us to appreciate our lives. Born in 1967 in Santa Monica, Biskup lives in Southern California and embodies its lifestyle and aesthetic sensibilities. Though academically trained, he interrupted that path early on, in 1988, leaving the Otis School, rejecting traditional art and concentrating on the Punk music scene and the charms of Disney cartoons. He learned techniques of animation, illustration, graphics and industrial design, developing an intentionally pop language. Besides painting, he produces multiples, prints, toys, books and images for rock concerts. Considered one of the leading exponents of the Lowbrow current, he represents its theoretical and perhaps less immediate aspects. He has had shows with various artists from the group, including Gary Baseman and Mark Ryden, in its galleries of reference like La Luz de Jesus. In the last few years, Tim Biskup work underwent what was mainly a stylistic change, the artist has developed a very personal technique of polygons and facets, making the paintings more precise, cleaner, without brushstrokes or curved lines, a very “sterile and severe” kind of painting that reflects his need to make his work a sort of meditation, or a mathematical process. His new paintings are completely abstract, while others are based on his photographs or on images taken from films. 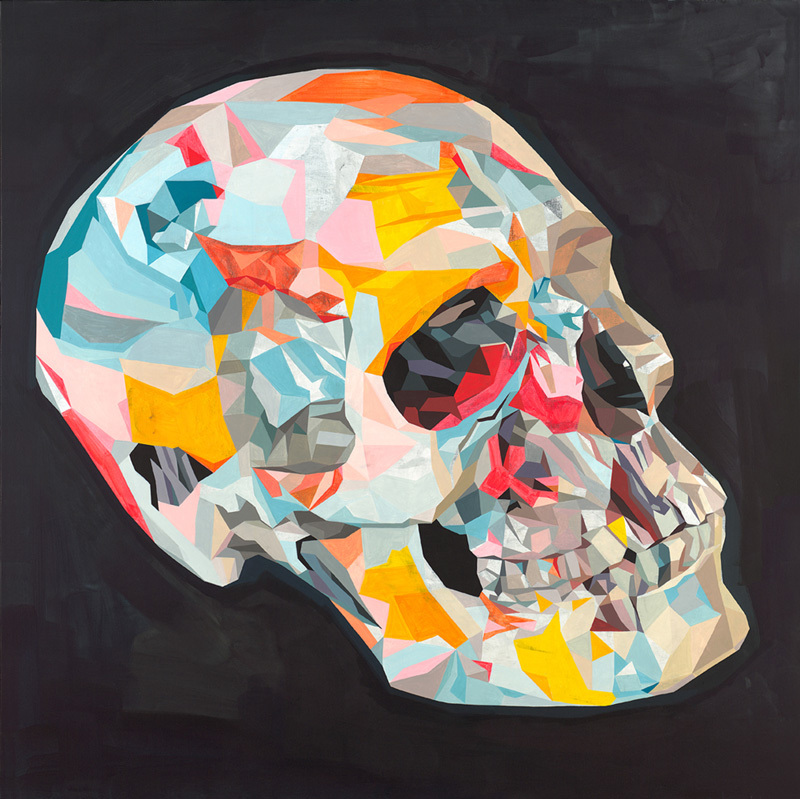 He calls himself a new Abstract Expressionist, though he does not completely avoid subjects, especially women, animals and skulls; above all, he says he can never get enough of the latter. For Biskup, skulls are icons charged with intensity, and closely linked to his personal background (horror films, punk rock, religion, mysticism, science). Tim Biskup (Santa Monica, CA, 1967) lives and works in Los Angeles. His works have been shown in important museums and galleries in Los Angeles, New York, San Francisco, Tokyo, Kyoto, Barcelona, Berlin, Sao Paulo, Buenos Aires and Melbourne. Among his most important shows: 2011 Former State, This Gallery, Los Angeles; 2010 Fantasilandia, Antonio Colombo Arte Contemporanea, Milan, Awesome Paintings, All Tomorrow’s Parties Gallery, New York; 2009 The Mystic Chords of Memory, Iguapop Gallery, Barcelona; 2008 O/S Operating System, Addict Galerie, Paris; The Artist in You, Jonathan Levine Gallery, New York; 2007 Ether, Billy Shire Gallery, Culver City, California; 2006 Vapor, Galerie Engler, Berlin; Pervasion, Laguna Art Museum, Laguna Beach, California. For some time now, Lowbrow (or Pop Surrealism) has been one of the most innovative areas of contemporary painting. The fact that it emerged from dark zones, underground and cult circles, has offered this genre a certain freedom of action and movement, allowing it to draw on a wide range of neighboring languages, from illustration to design, music to comics. With respect to the first decade of the century, many of the artists included in this current, who have taken similar paths of exhibitions, galleries, publications, etc., are demonstrating great development, and today that clear separation between the so-called “alternative” world and the mainstream is losing its clarity. Regarding many of these talents, we now hear talk of them as some of the most representative American painters of their generations. The museum is really right around the corner. The language is changing, in this sense, revealing the ambition of achieving more complex and reflective, perhaps less immediate forms, of absolute substance. This is true of Tim Biskup, as he approaches his first solo show in Italy. Born in 1967 in Santa Monica, Biskup has inherited an acidic, synthetic style from Californian visual culture, shared both with the world of illustration and with the works of West Coast painters like Lari Pittman or Manuel Ocampo, though he is certainly less symbolic. Though he has academic training, Tim interrupted it early on, leaving the Otis School in 1988, rejecting traditional art and moving towards the punk scene and the world of Disney cartoons. He learned techniques of animation, illustration, graphics and industrial design, translating them into an intentionally pop language. Besides painting, he produces multiples, prints, toys, books, and posters for rock concerts. Over the years the work of Tim Biskup has gone through evident changes, in conceptual and stylistic terms. He has refined a very personal technique characterized by polygons and facets, making his paintings more precise and clean, without brush marks or curved lines, a very “sterile and severe” painting that reflects his need to make his work into a sort of meditation or mathematical process. Geometry has always been an obsession in his style, even when he was making images that could be traced back to reality, intense icons closely linked to his personal history as a fan of horror films and punk, stimulated by religion and mysticism, intrigued by science. Tim is a youngster who doesn’t look his age of 45. He wears his hair quite short, has a well-groomed moustache and goatee, and a look that is in step with fashion, though serious, with a nice pair of glasses with dark Buddy Holly frame. His iPod contains “his” music, a mixture of alternative rock, electronics and noise, which he produces himself and often uses as the soundtrack to his shows. He likes to call himself a “new abstract expressionist”, and this desire for a label inside the current that decreed the beginning of American art par excellence, finally detaching it from European models, should only surprise us to a certain extent. The 1950s, with the crucial passage from painting based on gesture and sign (in Europe it was called Informal, while in the States the term was practically unknown) to the first examples of multi-materialism and new objectivity (in Rauschenberg and Johns), all the way to the explosion of Pop Art, are still the paradigm, representing the tradition of a young country that is certainly not burdened with the weight of centuries, like ours. Those were the days in which art and social transformation walked in lockstep; critics and theorists like Rosenberg and Greenberg even bitterly debated their positions, and painting began to sense the responsibility of approaching the challenge of the third dimension, of space. Over sixty years have passed since then, and many things seem to have returned to their starting point: in the end, in America painting has never been forgotten, nor has it had to defend itself against the periodic death knells tolled by the most contemporary, fashionable critics. It is alive and well, and so be it. Abstract art continues to cast its spell because from generation to generation it is perceived as the starting point of modernity. The American history with which one has to come to terms. Maybe it wasn’t legitimate to expect a move towards abstraction on the part of an artist known for his acid graphic sign and shrill colors, undoubtedly linked to the alternative universe of Lowbrow: and yet, it is precisely there that “It is where my purest lines are. My style and personality are free and intense when I throw everything else away. Abstract drawing and painting reminds me of my identity and prepares me to approach figurative imagery.”. These new works, none of which have been shown elsewhere, play on the thread of memory, and it is as if Biskup were bringing back, on paper or panel, what he recalls of a given object, attempting to abstract its pure essence, giving up description and narration. From a stylistic viewpoint these works remind us of those of Terry Winters, an artist also appreciated as a theorist, who has made the effort to redeem the abstract sign from the mechanism of chance, to insert it inside a mathematical and architectural order. Biskup seems to be so concentrated in this new phase that he is able to also utilize, in a version mixed with abstraction, which takes on the old decorative aspect here, “his” image par excellence, a sort of signature, the thing that makes his work recognizable at first glance, namely the skull, in the cycled called “Doom Loop” and numbered in progressive order. “For as long as I can remember, I have been obsessed with the image of the human skull. Clearly, I am not the only one who feels this way. Perhaps it is the complex and elegant geometry and pure aesthetic balance of the object. More likely our attraction comes from our guts and not our eyes. The skull is ourselves stripped of life. It is a clear reminder of our mortality. It can be a brutal and unnerving signpost that stares us down and fills us with dread, but at best it brings us into the present and reminds us to appreciate our lives”. It might be worth devoting deeper study to why our era is so full of images that hark back to the “vanitas” and the “memento mori” that originate in the Baroque. A phenomenon that has shifted from art to fashion, passing through illustration, design and the production of gadgets, a mania that extends from costume jewelry to iPhone cases. Apart from any psychological reasons (the uncertainty of our times, the sensation of non-eternity that troubles us, the difficulty in finding a metaphysical foothold to allow us to hope for a beyond), we can only linger over the simple beauty and charisma of the perverse and fascinating image of the skull.